What makes a robust egg? Not all eggs are capable of becoming healthy embryos. Distinguishing good eggs from the bad ones is a difficult task for fertility doctors. Studies conducted on mice revealed healthy eggs accumulate a large amount of zinc—50 per cent more than other important metals like iron—in healthy women to attain maturity and be ready for fertilisation. Researchers plan to study how the nutritional status of women affects the zinc content in the egg. 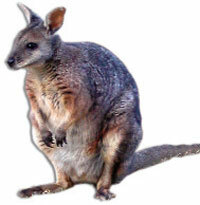 Australian tammar wallaby and South American opossum may seem to be quite different. A study puts them in a family. Researchers studied genomes of 20 Australian and South American marsupials and analysed a DNA fragment called jumping gene. It is a piece of non-functional DNA that is copied from one ancestor to all its descendants. Using the gene they traced the common ancestor and said Australian marsupials originated in South America. Previous studies said marsupials originated in Australia and that some might have been split when the landmasses separated 80 million years ago. Computer scientists have found a way to store data on a plastic data device that promises faster processing and consumes less power. Instead of writing data in a binary code of ones and zeros, the technology spins electrons of the data device and polarises them in definite directions, so that they store data. Dubbed spintronics, it can help store and transfer twice as much data per electron. Since flipping an electron requires less energy they would consume less power. Palaeontologists have unearthed the fossil of a 100 million-yearold crocodile species in Tanzania, which tried hard to be a mammal. The distinctive feature of Pakasuchus kapilimai, literally, cat crocodile, was its dentition. 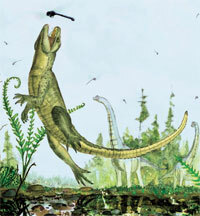 Unlike modern crocodiles, its teeth resembled mammals’ canines, premolars and molars. Such dentition required for grinding food was once thought to be unique to warm-blooded mammals. The flexible spine of the cat-sized reptile shows it was better at leaping in the air to catch flying insects. Such characteristics were similar to features critical during the course of mammalian evolution. Simulating future changes in the climate and amount of CO2 absorbed and released by oceans and forests, meteorologists have determined exactly how much CO2 humans can emit to ensure the earth remains below the critical threshold for climate warming. They suggest carbon emissions will have to be reduced 56 per cent by 2050 and then brought down to zero by the end of 2100. At this rate the CO2 equivalent concentrations in the atmosphere would be stabilised at 450 parts per million, so that global warming increases to a maximum 2oC above the preindustrial level. Scientists have identified genes that make some individuals more vulnerable to bacterial meningitis than others. They scanned the genome of 1,400 bacterial meningitis patients and compared it with the genome of 6,000 healthy individuals. The findings showed susceptible people had alterations in their genes for a protein, Factor H, which regulates bacteria-fighting in the immune system. Meningitis bacteria are able to hijack the protein and use it to enter the body without being attacked. The finding raises hope of developing meningitis vaccine. The disease affects brain and can be fatal unless treated in time. Children are particularly vulnerable. Ever since the time of Benjamin Franklin, kites have been used to study atmospheric traits. Important of them is measuring wind speed through sensors mounted on it. Placing sensors under the direct influence of sunlight, however, heats up the electronic device, affecting its accuracy. Researchers have managed to get past this limitation by measuring tension along the kite’s string. They tied it to a strain gauge on the ground. Since tension along the string is caused by wind, readings on the device can be used to measure the wind speed. The scientists used a two sq metre Rokkaku-type kite, which is stable. They plan to refine the kite’s design so that it works in turbulent wind. A group of US researchers has contradicted reports that say the Moon had water at the time of its formation. Their finding suggests the interior of the Moon may be too dry to host life. They analysed rock samples from the Moon for different isotopes of chlorine—an element that gets attracted to water and hence a sensitive indicator of hydrogen level. The range of chlorine isotopes in the samples was 25 times greater than that found in rocks in the Earth. If the Moon had significant levels of hydrogen, as Earth did, this range would have been far less, the scientists said. The abundance of chlorine points to a lack of hydrogen and hence water. The finding does not challenge the findings of water on the Moon, including thick deposits of ice by India’s Chadrayaan-1. They say the ice found on the Moon surface could be due to cometary impacts and the ice is from the comets. 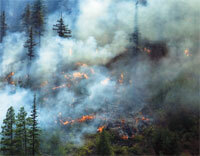 Forest fires enrich soil with nitrogen, necessary for healthy growth of plants. Researchers have found charcoal deposited during fires has the potential to stimulate the conversion of ammonia into nitrates, an important step in the nitrogen cycle that enriches the soil. The type of bacteria that transforms ammonia into nitrates was found in abundance at sites that were burnt 12 years ago or earlier. In coniferous forests when fires had occurred had greater rates of nitrification, meaning nitrogen was being processed more quickly through the ecosystem. Tropical rainforests harbour more than half of the plants and animal species on the earth. But if deforestation continues at the current rate and climate change predictions are accurate, only 18- 45 per cent of the plant and animal species making up the ecosystem would be left by 2100. 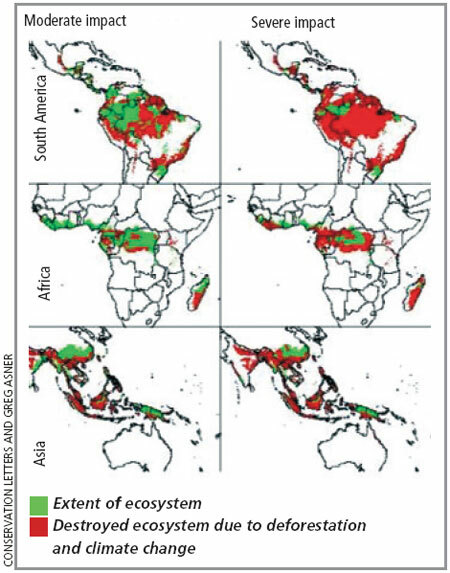 Scientists prepared a map of the shrunk ecosystem by integrating satellite maps of deforestation with data on future vegetation changes due to global warming from 16 climate models.